“Tuscany”. Try to say the word out loud. It rolls of your tongue, smooth, round and effortless. It is so easy to picture endless green hills, beautiful little houses spread across the endless green, and of course, sun-soaked grapes. I visited Italy many times, but not the Tuscany, which still stays on the “dream destinations” list. I can easily picture bringing my family there, renting a little villa (there are many villas in Tuscany), and spending time doing… nothing, just enjoying that beautiful scenery, true, simple and honest food and of course, the wines. The wines of Tuscany hold its own special and unique place in the wine world. True, the wine making was born outside of Italy ( Georgia and Greece are the top contenders for the title of “cradle of the winemaking”). But where else you can find wineries and winemaking families which are almost a thousand years old (look at Barone Ricasoli, which is tracing its wine history to 1141, or Castello di Ama, which goes all the way back to 1210), next to the wineries which propelled from non-existent to the world’s best in mere 30-40 years, as many of so called Super-Tuscan wines did? Tuscany offers tremendous diversity when it comes to wines, and I want to take you on a little tour of Tuscan wines. We are going to start with Chianti, one of the oldest wine-making areas in Tuscany, located in the center of region. 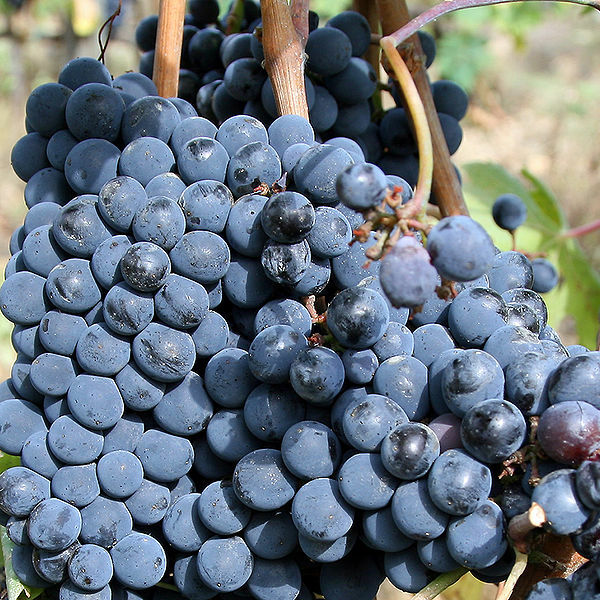 Sangiovese is the main grape which is used to produce Chianti wines, but other grapes can be also blended in, including both red and white grapes. Then there are all sorts of classifications for the Italian wines – but I really don’t want to bore you with the details of it. While classification information is very important, there are so many available resources covering subject in depth, like this Wikipedia article, for instance, you can definitely learn about it without my help. 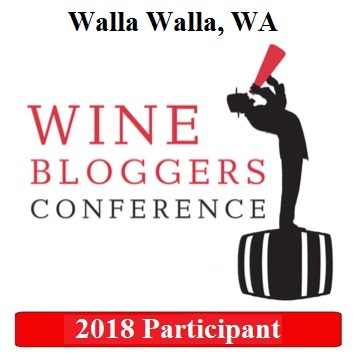 As a side note, I want to mention that in the end of the day, DOC, DOCG, IGT , the producers and the wine ratings are all important, but you really have to let your taste buds be a judge when it comes to finding the wine you like. Chianti are some of the oldest wines with the world, with the very rich history having its up and down times – it is impossible to cover Chianti’s history at any good depth in the blog post, so again I have to refer you to the great source – the Wikipedia article. Chianti wines are usually split into two main groups – Chianti and Chianti Classico. Chianti Classico, which comes from its own part of the Chianti region, is available as Chianti Classico and Chianti Classico Riserva, which is usually aged for more than two years before it is released. 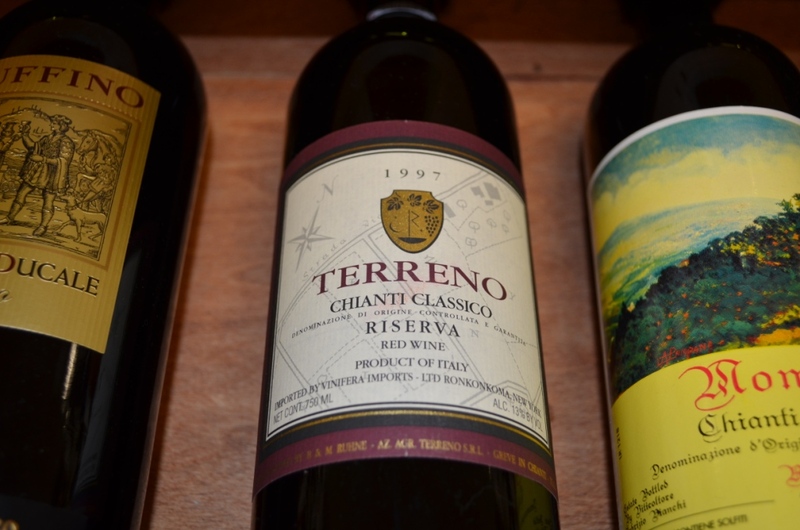 If you are looking for a good bottle of the Chianti, you can always play it safe and go by a good producer – Antinori, Castello Banfi, Castello di Ama, Fontodi, Frescobaldi, Monsanto, Ricasoli, Ruffino are all well known producers and represent a good bet as you are looking for your next bottle of Chianti. Let’s move down south from Chianti to the town of Montalcino. A bit younger than the Chianti, only going back to the 14th century : ), there was a local wine produced there, which was called Brunello, referring to the name of the local grape. Eventually it was established that the actual grape was a clone of Sangiovese, called Sangiovese Grosso, but the name of Brunello always stayed with the wines called Brunello di Montalcino (often referred to simply as Brunello). 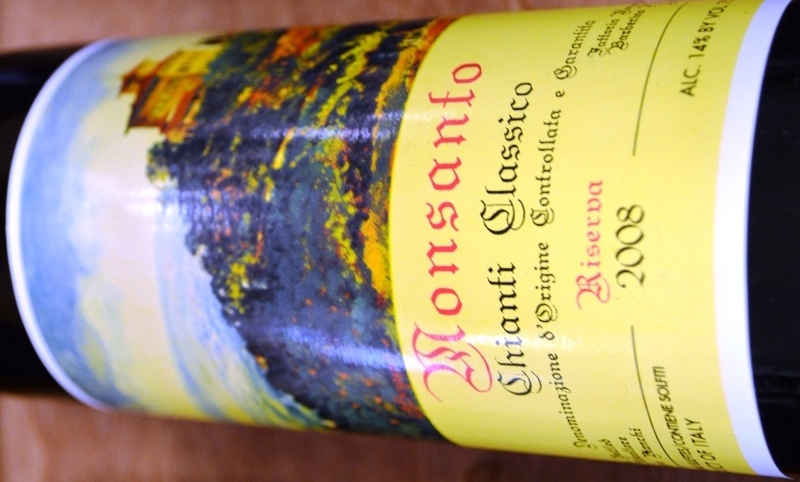 In order to be classified as Brunello, the wines have to be made from 100% of Sangiovese Grosso (no other grapes allowed). 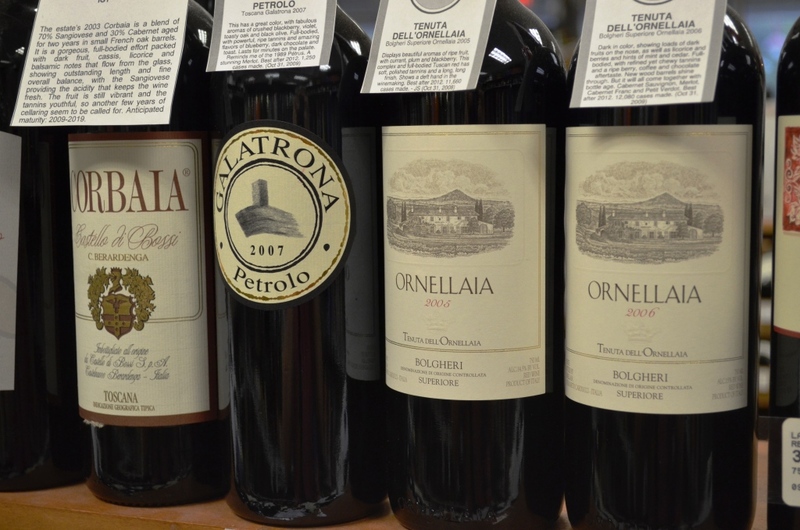 Over the many years, Brunello built a reputation as some of the best wines in the world – power, finesse and ultimate ageability make them very desired wines among wine consumers and collectors. Biondi Santi is probably the most legendary producer of Brunello wines, but Altesino, Casanova di Neri, Castello Banfi, Poggio Antico, Valdicava are all well worthy of your attention. Continuing our tour from the town of Montalcino, we got two options – we can move east, to the town of Monepulciano, or west to the region called Bolgheri. Let’s talk about Montepulciano first, as Vino Nobile di Montepulciano wines are rivaling Chianti in its history. The first references to the vineyards around Montepulciano go all the way back to the 8th (!) century, but it was not until 1925 that the wines from the region are actually assumed the Vino Nobile name. Vino Nobile di Montepulciano wines are again produced from Sangiovese clone, known as Prugnolo Gentile, and often blended with other local grape varieties. Vino Nobile di Montepulciano are lesser known then Chianti wines, but they are worth looking for as they still provide a good value. And now, let’s go all the way west, to the coastal area of Tyrrhenian Sea, to the town of Bolgheri, where some of the best wines in Italy are made. I’m sure you heard the term Super-Tuscan – these are the wines made in Tuscany, but in completely non-traditional way. Starting from 1960s, Bolgheri was a center of Super-Tuscan wine revolution – instead of making the wines by the strict Chianti rules, many vintners started producing wines based on terroir, always looking for the best grapes from particular vineyards. 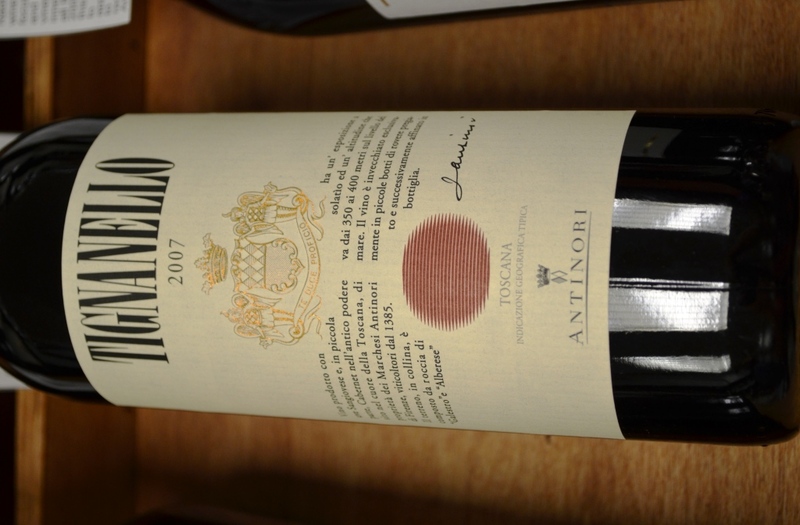 In 1978, Antinori started producing the Sangiovese-Cabernet Sauvignon blend wine called Tignanello, which became a great success. Many winemakers turned their attention to traditional Bordeaux varieties, such as Cabernet Franc, Cabernet Sauvignon and Merlot, eventually producing the wines rightfully called some of the best wines in the world. Today Super-Tuscan wines need no introduction, and absolute majority of wine lovers can’t pronounce the names such as Ornellaia, Solaia, Masseto, Sassicaia, Redigaffi without their breathing stopping for a second and eyes rolling up to show utmost respect. You don’t need to take my word for it – get a bottle and taste it for yourself, and you can thank me later. Before we are done here, I want to share some interesting numbers with you. You probably heard of Wine Spectator, a very famous wine magazine. Wine Spectator has their 100 points rating system and obviously, it is not simple to get a 100 points, as the wine should be truly ultimate to get such a high rating – only 74 wines out of more than 250,000 rated wines received 100 points. Out of those 74, 13 are Italian wines. Out of those 13, 6 are the Tuscan wines. And out of those 6, 2 are Brunello di Montalcino wines, 3 are Super Tuscan, and one wine is a Vin Santo – another famous Tuscan wine, this time it is a dessert wine, made out of Trebbiano and Malvasia white grapes. And to complete the picture, do you want to guess what grape those 100-point Super Tuscans are made from? Sorry Miles ( remember movie Sideways? ), but all three 100-point Super Tuscans (Tenuta dell’Ornellaia Masetto, Tua Rite Redigaffi and Le Macchiole Messorio) are made out of 100% Merlot! I think it is time to finish our tour. Tuscany makes a lot of great wines, and there are many books, articles and blog posts covering those wines from all possible angles. I think my top tip for choosing the Tuscan wines will be very simple – go out and play! Open a bottle of Tuscan wine, and be transported in the instance to the warm and inviting land of great food, wines and people. Salute! Congrats on over-coming your writer’s block! A great piece. I was tempted to write as wel, but my focus has been lacking. I will say that one of the most enchanted memories I have of my time in Italy with my husband was in Montalcino. As we passed through the walls of the city, we noticed a food and wine festival in full swing. We purchased a glass of Brunello and sat in the park and listenened to music. It may turn into a post eventually, but not by today’s deadline. Best of luck! Thank you! Appreciate the comment! Yes, I literally had to force myself just to drop everything and push it through. Thank you for your steady encouragement. It means so much. Winning would be great by itself, even if there would be no wine as a prize. To tell you the truth, when I got an invitation to participate, my first reaction was “yeah, okay”. But because it was a competition, and because I was invited to participate, somehow it became more of a personal challenge to write a post which I would be at least semi-happy with, so I’m glad that I was able to overcome this challenge. I thought the winner would get 6 bottles of Chianti wine. Or is the link below something else? Since this competition is mostly an ad for “villas in Tuscany” I decided not to write an article for the competition. Wow, when you overcome writer’s block, you do not fool around! Excellent piece that I am sure will be in the running for the prize! ahh, thank you for your kind words! For some reason, it was not easy to write this piece, I barely made it on time! Wow!! Looks like my vote for next summer’s vacation will be Tuscany! I will just tell my husband that your post was very convincing! Great piece! I was toying with the idea of entering after letting three approaches macerate in the brain a while, but finally decided to read some of the entries received first to eliminate any similarity in approach. Your entry stopped all thought of entering, as I know I cannot top this. And, my shopping list just grew longer. Congratulations on a great entry. Thank you very much for your kind words! I’m very humbled and excited to win the competition, as there were a lot of good entries. Will definitely write a post about Castello Di Ama once I will get a chance to open a bottle. Thanks again! 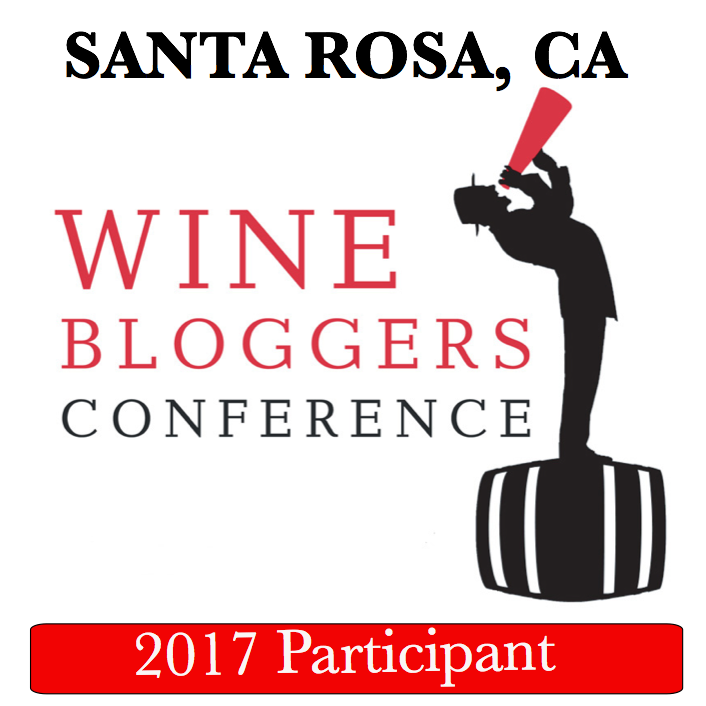 Wednesday’s Meritage – Wine Quiz Answer, Thursday(s) Celebrations and more Weekly Wine Quiz #35: What is Missing?